According to our Forum, It is currently Fri Apr 19, 2019 2:33 pm, please have a look around and feel free to Register. It's free and really easy! After seeing the amazing work of a number of sci-fi modellers online including Lincoln Wright and Jon Bius, I've been keen to try my hand at building a small diorama from the 'Maschinen Krieger' property. For those not familiar with this 1980's Japanese franchise/universe, these are basically large-scale retro-futuristic (if that's a thing) battlesuits, vehicles, and figures based in a distant dystopian, war-torn future where WW2 meets Robotech. I have opted to build a diorama centred around a MK44 "Knightknight" Protoype battlesuit (supposed to be designed for heavily armed lunar combat apparently). At this point I'm thinking I will ignore the 4x kit colour schemes/decal options provided and build a 'Mars' variant of the model (so think red camouflage with heavy weathering and contrasting coloured accents). I am aiming to have the battle suit sitting in a workshop scenario (maybe onboard a space-station or ship repair bay?) with the cockpit 'open', showing the pilot chatting with a female flight engineer alongside the squadron's faithful German Shepherd. All models were ordered from Japan and arrived just before Christmas. The first thing you really appreciate about these models on opening the box is the sheer scale. The 1:20 size allows for some amazing detail and great weathering potential. Here is a photo of the first evening's construction on the MK44. I have been busy working on kit-bashing a replacement weapon for him out of parts in the spares box, as the provided 'smartgun' looks a bit insipid out of the box. 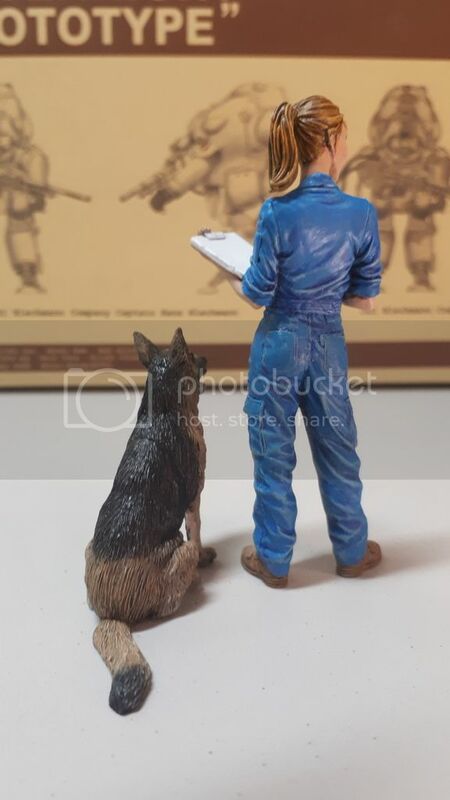 I have commenced painting the resin female flight engineer and Alsatian, starting with a black base coat of Mr Primer 1500 mixed 50:50 with self-levelling thinner. They were then given a highlight with white, sprayed at low pressure to emphasise reflected light, while keeping the darker areas 'in shadow'. 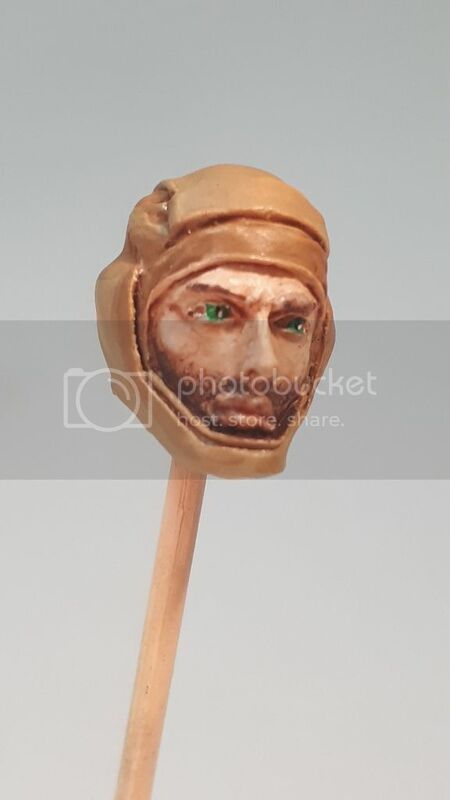 I also have a standing resin 'pilot' figure which I plan on adapting to replace the uninspiring kit-provided pilot bust. The girl's overalls were airbrush with very thin coats ofTamiya powder blue and given some darker shadowing with Tamiya clear blue, before being dry-brushed and highlighted with a lighter shade of the base colour. The hair and skin were airbrushed using GSI Creos lacquer 'flesh' mixed with a small amount of brown to darken it up, before highlighting the raised areas (nose, cheekbones, forehead etc) with lighter shades of the base flesh tone. Eyes and blondey-red hair were handpicked with a 000 brush (pupils and white reflective dots painted in with the help of a sharp toothpick!) after a thin wash of Warhammer 'Reikland Flesh shade'. On the bench: 1:35 Tamiya Chieftain and 1:20 Hasegawa Maschinen Krieger Whiteknight Prototype Battlesuit and assorted figures. "Greater love has no one than this, than to lay down one’s life for his friends." This gives the smooth plastic a rough, 'cast' look, and to my eye is reminiscent of heavily pitted WW2 tank armour. Prior to the prime-coat, I added a number of greeblies from parts out of my spares box to dress up some basic looking panels, and have used a bit of brass mesh to cover various vents and ports (which looked a bit basic in the stock config). The aftermarket resin standing pilot figure I bought has been cut through the waistline to make him fit within the cockpit, and replace the very basic kit pilot (who doesn't have arms which limits the ability to display the battlesuit 'open'). The pilot's arms and shoulders have been shaped with a Dremel and set in a resting pose against the seat frame, as if the front of the 'clamshell' armour has just been opened. I aim to model him with his helmet off and being held in hand as he chats to the mechanic girl. I made up a small amount of Citadel/Warhammer green-stuff 2-part putty around the pilot's waist, and the suit's arm holes to simulate an inner suit fabric 'liner', but unfortunately this meant I could not readily remove him from the cockpit prior to priming. Never mind - will paint him in place. Pilot head/face to be painted and added later. Now that all the leg-work with the construction is completed, I can get down to the fun stuff - painting and weathering. I have selected a colour palette centred around Vallejo RAL8012 German Red-Brown (which will hopefully suit the Martian camouflage vibe I'm going for) and reminds me of WW2 German armour primer. Although the plan is to make Red-brown the base colour, the plan is to adopt Vallejo 'Aged White' and RLM65 underside light blue for various panels over a layer of Vallejo 'chipping medium', and worn away to expose the red-brown beneath. Heavy weathering and decals to follow this. That's the plan anyway! I also aim to experiment with Vallejo's new 'Mecha Colour' paint, with details such as a single shoulder pad, or fuel tank to be picked out with Vallejo Mecha light blue. Decal-wise, I'm still considering various aftermarket routes - stay tuned. The Battlesuit has now been airbrushed with a coat of Mr Hobby buffable Metal Colour 'Iron' (#212), and then dry brushed with the same product line in aluminium. These paints are a bit more expensive than the regular Mr Hobby range, but give an amazing finish, especially when polished. I haven't used Alclad before, but I imagine the results are comparable. The metalic surface will provide the 'base' layer for the suit, and it is hoped that future color coats will be worn down to in places to expose the bare metal following the various coats of chipping medium and camouflage. Here is a closeup of the heavily modified 'smartgun'. With that done, I moved back to work on the figures for the diorama. The Alsation was given a base coat of Tamiya Desert Yellow, with flat black patches added on top using Google pics as a reference. White was added to the chest and legs to highlight, over a drybrushed coat of lighter brown. Finally, he was given a wash of Warhmmer Agrax Earthshade, then eyes, tongue and teeth were pained in with a 00 brush. The was then sealed with thinned Vallejo Matt Varnish. The engineer has also been completed, having picked out the T-shirt in Tamiya white, adding a heavily thinned pink wash to the cheeks, and glueing the head and left arm in place with superglue. She was also sealed with a coat of Vallejo matt varnish. I wasn't entirely happy with her eyes the first time round, so ended up scratching them back with a toothpick and repainting, and am much happier with the result. 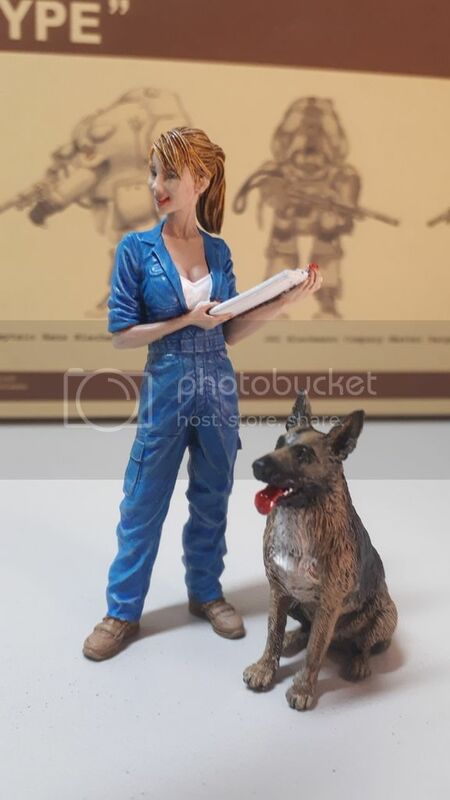 Female engineer and dog completed. The safety cones actually came with the dog, and should look cool placed in the finished diorama. They were simply base coated with Tamiya orange, masked off with tape, and stripes added in white. Those are seriously good airbrushing skills - I wish I could paint like that! I've really enjoyed painting these resin figures. They're the first I've attempted at a large scale, having only historically painted Games Workshop etc. miniatures in the past. 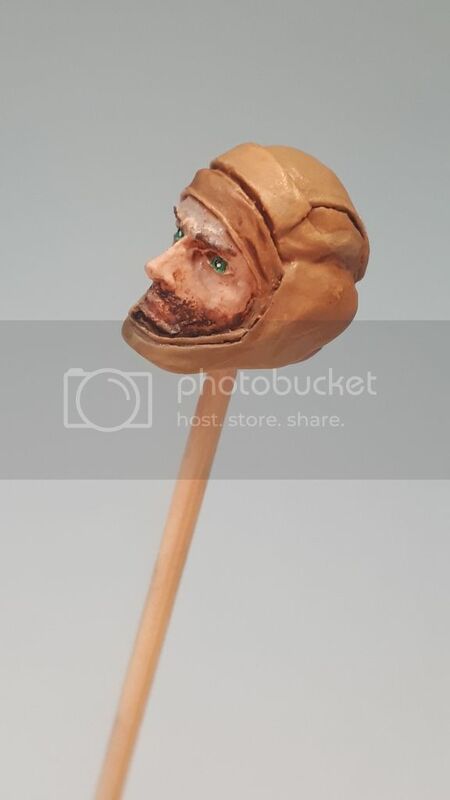 Here are a couple of additional photos showing the finished pilot's head. His helmet is underway, so more pics to follow. Very nice. I built two of the same themed kits back in the early 1990's and still have them packed away I think. I might have to try and find them to take some photos one day. Those early kits would probably worth a pretty penny these days, Harvs! You should dig them out and put some photos up for us.